An original letter of correspondence between brothers and business partners Joshua Coffin Chase and Sydney Octavius Chase. 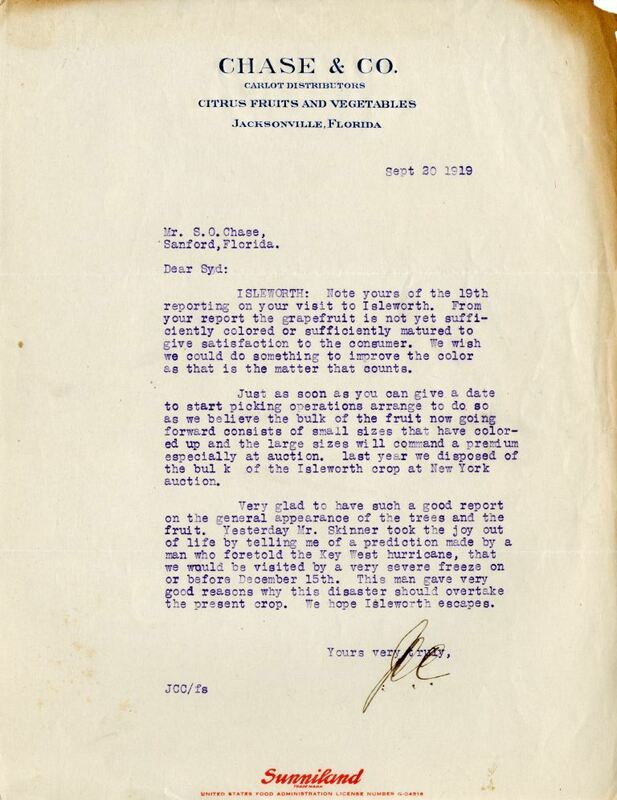 Topics discussed in the letter include Sydney's report regarding his visit to Isleworth Grove, the insufficient coloring and maturation of grapefruit, and a prediction of a very severe freeze by December 15, 1919. Original letter from Joshua Coffin Chase to Sydney Octavius Chase, September 20, 1919: box 49, folder 20.84, Chase Collection (MS 14), Special and Area Studies Collections, George A. Smathers Libraries, University of Florida, Gainesville, Florida. Digital reproduction of original letter from Joshua Coffin Chase to Sydney Octavius Chase, September 20, 1919. ISLEWORTH: Note yours of the 19th reporting on your visit to Isleworth. From your report the grapefruit is not yet sufficiently colored or sufficiently matured to give satisfaction to the customer. We wish we could do something to improve the color as that is the matter that counts. Just as soon as you can give a date to start picking operations arrange to do so as we believe the bulk of the fruit now going forward consists of small sizes that have colored up and the large sizes will command a premium especially at auction. last year we disposed of the bulk of the Isleworth crop at New York auction. Very glad to have such a good report on the general appearance of the trees and the fruit. Yesterday Mr. Skinner took the joy out of life by telling me of a prediction made by a man who foretold the Key West hurricane, that we would be visited by a very severe freeze on or before December 15th. This man gave very good reasons why this disaster should overtake the present crop. We hope Isleworth escapes. Chase, Joshua Coffin. 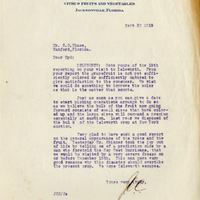 “Letter from Joshua Coffin Chase to Sydney Octavius Chase (September 20, 1919).” RICHES of Central Florida accessed April 24, 2019, https://richesmi.cah.ucf.edu/omeka/items/show/2746.